The Guitar Column: Cryptic Message On Analogman Pedal? This Analogman pedal had me doing a double take. 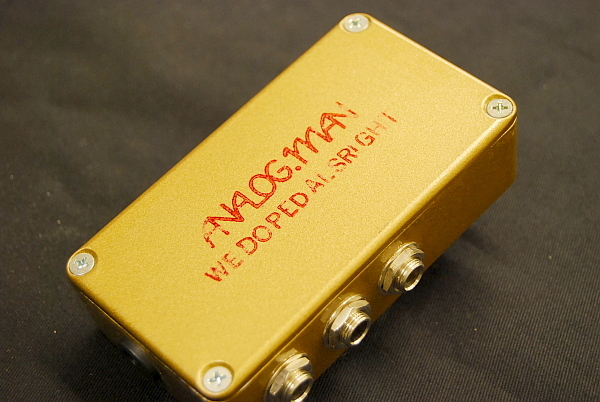 Silkscreened on the back of this innocuous, but very fine Analogman custom loop pedal is "WE DOPED AL SRIGHT". Who is Al Sright and why was he doped? Intrigued by this cryptic message, I accessed the Oracle of the modern information age. We have to get to the bottom of this. It's time to we all head down to our local boutique pedal store to check out as many Analogman pedals as we can. Don't forget to bring along a Phillips screwdriver so you can access the inside of each pedal as well. Look out for any serial numbers that might coincide with a date from the last ten years or so. Just because. And go ahead and plug 'em into your favorite Class A tube amp while you're at it. The mystery of Al Sright might be right there in the tone. Listen closely and let the pedal speak to you. After you've soaked in all that boutique analog juiciness, buy a couple and bring them home for closer inspection. No more pedal real estate on that 6' x' 2' custom pedalboard? Analogman pedals make great stocking stuffers for Christmas! Let's make this a concerted effort folks.